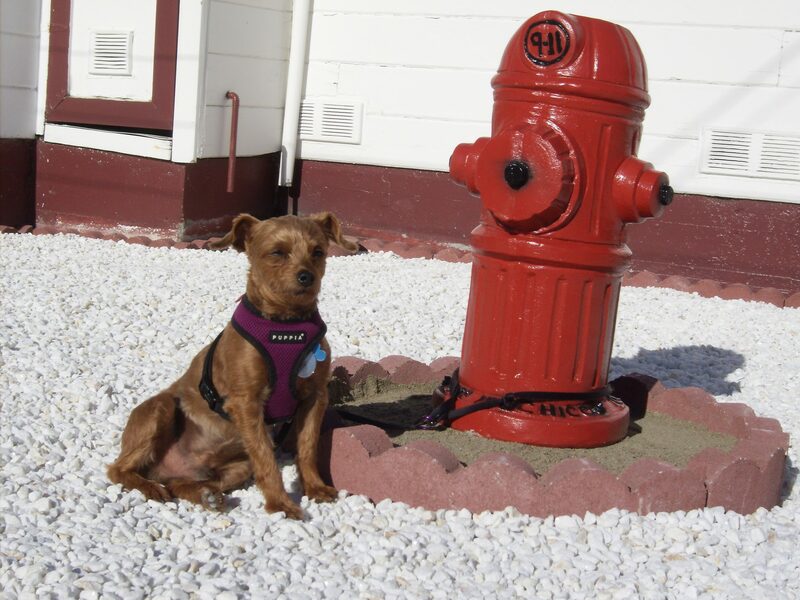 Fire Hydrants: An Ode | Will My Dog Hate Me? I occasionally miss things about New York that I never would have anticipated, including weird urban sights like smoke rising from manhole covers in the middle of the street. Frankie would hate the city, I suspect — too many people, too much noise — and he’s not a competitive urinater. He either squats or lifts his leg, balletically, in a single spot. So even if he visited Manhattan, he would probably skitter along the sidewalk rather than stopping to use the fire hydrant facilities. 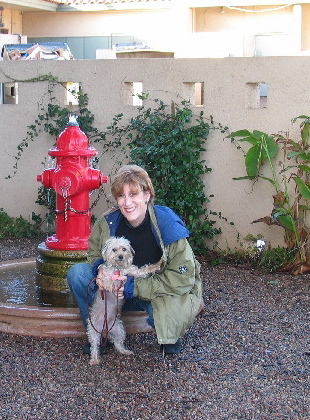 But the above picture sent by Carla (of Leap of Faith fame) of a backyard ornament created by her landlord reminded me that I have a similar photo of me and Frankie, taken at In the Raw, a dog-friendly restaurant in Scottsdale. This in turn took me on a trip down memory lane, back to the time when Archie taught Frankie how to pee like a man. Or at least more like male dogs generally do. So here’s to New York City and young(er) dog dreaming. Update: Rod Burkert of GoPetfriendly.com sent his own dog-with-fire hydrant photo, which I will dub Fire Hydrant Squared: In addition to the fire hydrant itself, note the poop bag holder at the end of the leash. 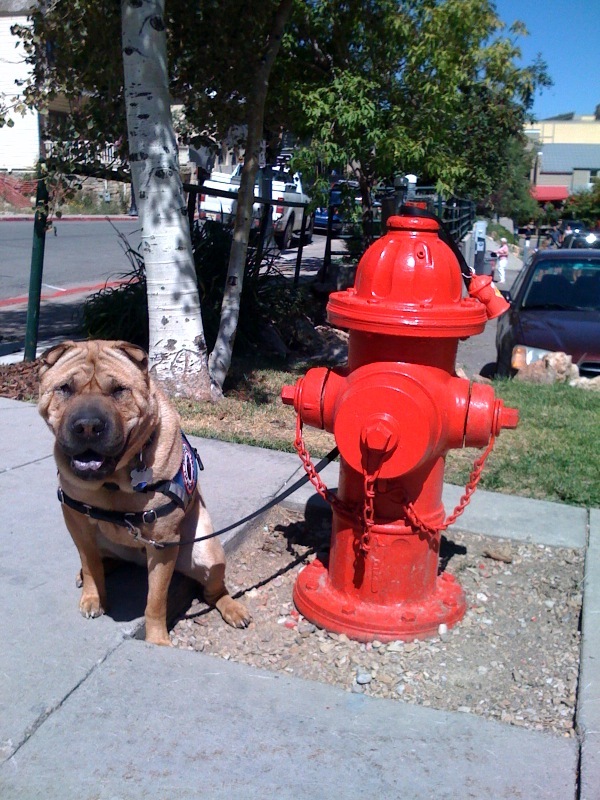 Feel free to submit your own dog-with-fire hydrant photos via jpeg to writestf at mac.com. I promise to post them. Missing NYC, eh? I hear you (and I was only a frequent visitor, not a one-time resident like you). The combination of our travels and an interview I did in our People Who Travel With Their Pets series has taught me a lesson: There are no favorite places … just favorite times at different places. PS – Buster is a very competitive full on leg lifting urinator! Ty is still a dainty squatter. I like that sentiment, Rod, though I think the place where one grows up gets a special favorite place — or at least ‘home’ — designation. Who knew — two male dogs with two distinct peeing styles! I love that Rod. Favorite times at different places totally described it. 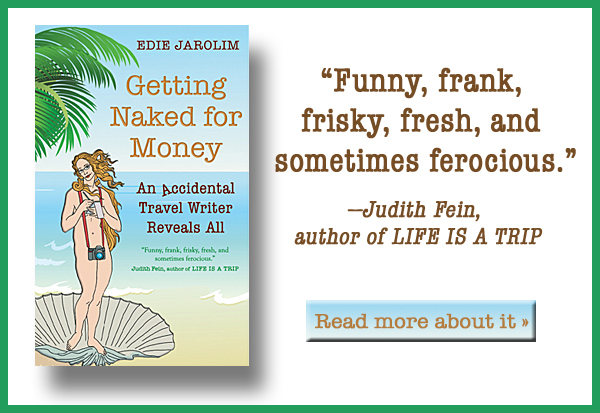 Edie – I used to travel to NY on a frequent basis for work. Loved the city, but I know that Daisy and Jasper would have hated it too. As Mary said, if anyone had told me a few years ago that I would have a discussion like this — in public yet! — I never would have believed it. Funny/sad the things we miss of “home”, the place, smells, sounds and rhythm of our childhood. I remember Chicago fire hydrants, and how the police would get mad when someone opened one so the children could play in it on a hot summer’s day. Tashi learned to pee from Dickens, who was too old to lift his leg by the time Tashi showed up for lessons, and consequently he squats like a girl or, in a more recently acquired manly pose, walks then stretches into a one hind leg further behind him than the other stance and does his thing. Mary, that’s hysterical, both the fact of Tashi stretching one find leg further behind him and also the fact that we’re having this conversation and it seemed normal to all of us! Gosh Frankie is a cutie! Look at that face! Ok, I couldn’t do it either and when I tried to put it into the post from a jpeg from the site, it was too teeny tiny to read. Thanks for sending though — it’s very funny. I’m impressed by the discreet draping of Frankie’s leash over his peeing parts! He is an ever-modest dog, isn’t he?